The first two series of Merlin have been fairly coy with a lot of the bigger expected plot points of any show tackling the Arthurian legends. Beyond wondering when Arthur will finally take the throne, the bigger question has always been when will everyone figure out that Morgana is not at all a nice lady? She has featured prominently across the seasons as being King Uther's dear sister but also the person the audience can count on to be up to something evil. 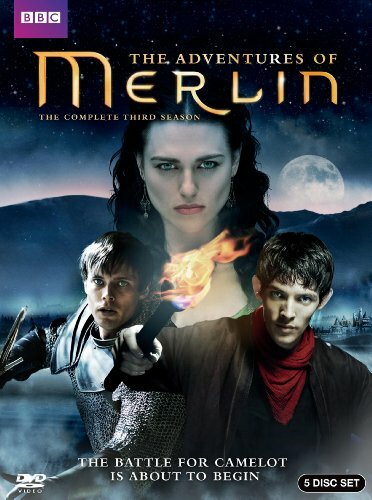 This third season finally kicks things off for the "real" story that we've been waiting for and gives the hope that we'll finally see Merlin step up to be more than just a serving boy. But the show remains consistent with its more gradual pacing that is has established in prior seasons so don't expect too much. But yeah, this is the season where things at least begin to turn. The show remains fairly focused on a younger demographic, but at least the story has begun to get pretty interesting. Synopsis: Merlin is a British fantasy adventure drama series created by Julian Jones, Jake Michie, Julian Murphy, and Johnny Capps for the BBC. The series spans 13 episodes like the ones before it. The season begins with pretty much the whole Kingdom searching for Lady Morgana (Katie McGrath). While everyone trusts her as the sister of King Uther (Anthony Head), young Merlin (Colin Morgan) has more than a few suspicions about her intentions. And more and more Morgana has been working with Camelot's enemies to possibly take power for herself. This season also begins to bring in characters of later importance including the future knight Gwaine (Eoin Macken). More and more signs point to Morgana having darker designs with the aid of Cenred (Tom Ellis) and Morgause (Emilia Fox). And both Merlin and young Arthur (Bradley James) have some hard choices ahead of them. Synopsis: I had felt that the last season spent a bit too long with odd episodic stories that didn't feel all that tied to the central Arthurian legends apart from the involvement of Morgana skulkling around a bit. This one finally brings in characters of interest and starts to arrange the board such that Arthur's becoming king looms ever closer. You don't expect the show to suddenly follow the pattern of the classic tales given all that has come before but at least things feel somewhat more familiar. They really played with a lot of concepts this time around including visions from the Crystal Cave, a gold-obsessed goblin and even a Changeling. And I liked this little diversity in story types while still trying to depict the continued growth of Merlin's abilities. It's not perfect and they've been taking a long time to get here but at least they're moving again. What Could Have Been Better: The continued lack of plot development for Gwen / Guinevere (Angel Coulby) has been a bit of a sort point for me and I felt this season cemented her role in the background of things. We just sort of know that Arthur likes her but we never really got to appreiciate why - just that this love is more or less forbidden and thus forever secret. It doesn't feel earned and this season does little to address that. The actual plots that Morgana, Morgause and Cenred come up with are a little odd and rarely effective, as the show repeatedly depicts. And it's not they faily directly because of Merlin's involvement in things. So I'm not sure where to go with that. Plus Arthur isn't quite out of his father's rather inactive shadow. TL;DR: This season of Merlin is more exciting for the characters involved and not necessarily because of the stories themselves. But it's still good fun and worth the watch. Thus the season gets a good 3.5 moments of Morgana slipping away to meet wit Margause out of a possible 5.